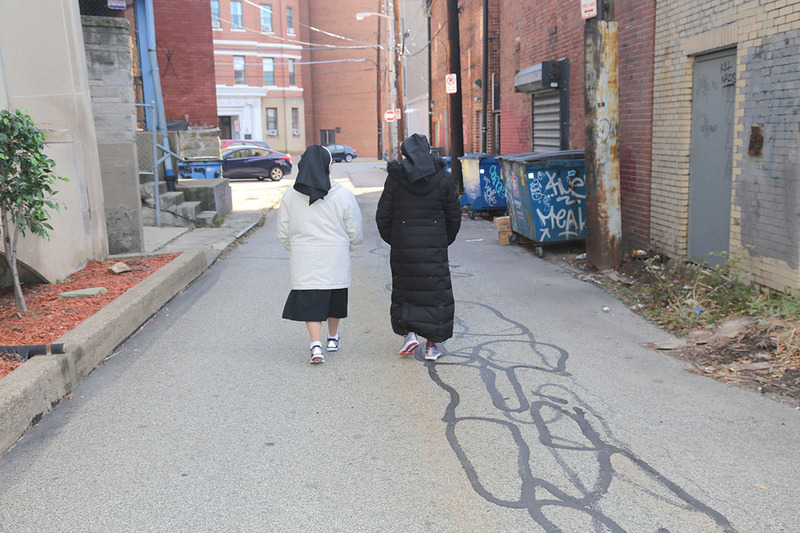 On any given day, Sister Theresa Margaret Bealer and Sister Norma Rodriguez can be met walking in the neighborhoods of Bloomfield, Lawrenceville, and Garfield. Many people know them for their kind and compassionate ministry to residents and those they meet along the way in their street ministry. 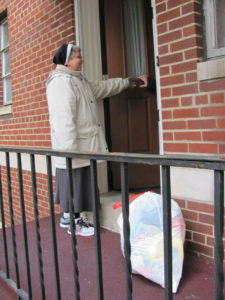 Sr. Norma arrives at home of elderly woman. In 2009 the Sisters of the Holy Spirit established a volunteer program to aid the poor elderly of the area. Since that time their assistance reflects a variety of works . Many days are spent accompanying some to doctor appointments, visiting them in their homes and hospitals, cooking and cleaning homes for those unable to do so, taking the Blessed Eucharist to those who are Catholics, and assisting those who are making transitions in their living arrangements. 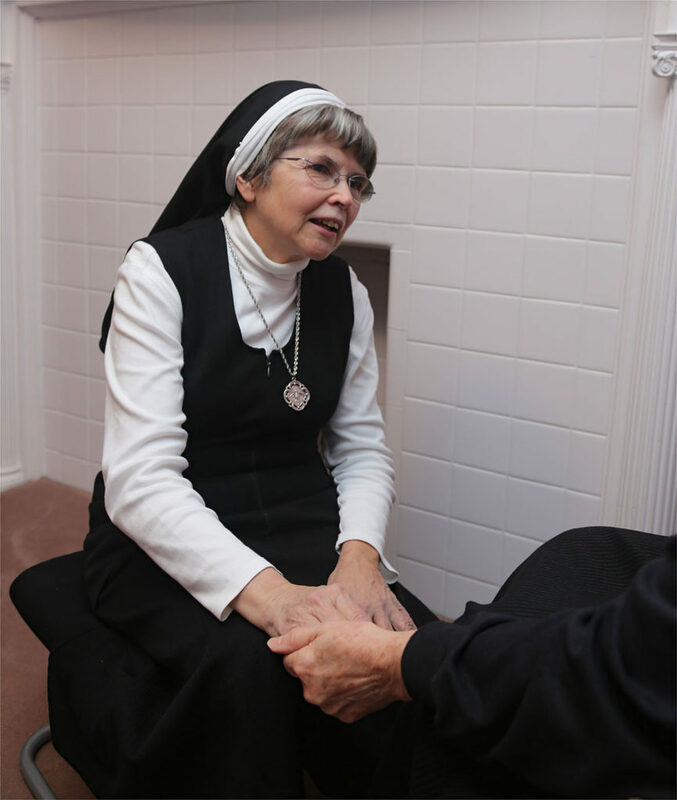 In addition Sister Norma provides hospice care, sitting with the dying and giving the families time to be away to relax. She also shares scripture and assists them in knowing Jesus and becoming better acquainted with the Holy Spirit in their lives. Sister Theresa also plans and provides prayer services at wakes for non-Catholics. Both Sisters attend wakes and funerals for many people. 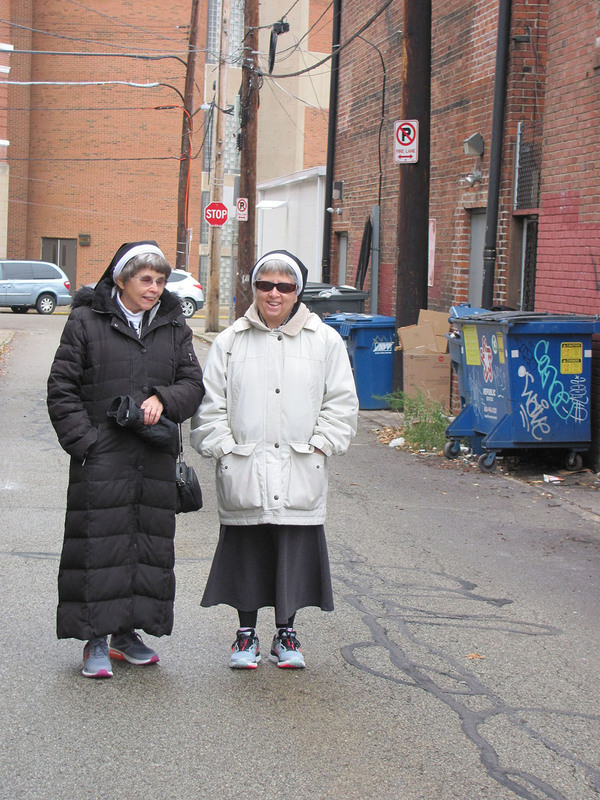 Truly the ministry of these Sisters is one which meets the needs of some of the most vulnerable people in these areas of Pittsburgh. Sr. Theresa meets with elder person. This ministry is a reminder to all of us that there are many people who live alone and who have no one to care for them. If any reader of this ministry would like to help, perhaps a phone call or a visit to a neighbor, relative, or person who is alone will help them to know that they are not forgotten but that they are loved and cared about. Just know that each one of us has the ability to listen to the Holy Spirit about how we can be creative about the ways we can show our love and care for one another. It is also good to remember that what we do to others, we also do to Jesus. The Sisters of the Holy Spirit pray that God will bless you and all your loved ones, and may all of us be attentive to the presence and power of the Holy Spirit working in our dear world, always assisting us to be and to do more than we could ever be or do ourselves. It is a while since we talked but I remember you with love! My time living at your Mother house in 1995-97 is a time I will not forget in my life! From time to time, I check on your website just to catch up with you. Thank you for all you do for the elderly and other needy people. Good to hear from you! Miss you my friend!